This timeless book is written exclusively to lease/owner Operators in Canada. It deals with the many various aspects of choosing an appropriate carrier contract for your truck. It exposes the myth that all trucking company contracts are the same. It charts 13 different contracts and shows the net cash flow difference (all else being the same). It also charts the changes in contracts starting from 1996 and ending in 2012, answering the questions: What has deregulation done to lease operator contracts? After 16 years, did operators have more or less take-home pay? No book to operators should ever be published without a clear analysis of net fuel costs. This book will not disappoint in that regards. Over 30% of it is dedicated to net fuel costs as it pertains to price and contract differences. The business logic deals with: IFTA, market fuel prices, currency exchange rates, fuel subsidy (carrier to operator) as well as other cost peculiarities. It contains everything an operator needs to understand in order to survive and thrive in a volatile fuel cost environment. It is diverse and extensive in its coverage of various issues that have and are affecting lease/owner operators. Probably the biggest impact was the 2000/2001 recession during which time the fuel costs spiked after a decade of stability. The influence the spike had on carrier contract development is significant. In nearly 40% of all contracts the issues still aren’t properly dealt with. Generally speaking most won’t be reading it in one sitting. It usually should be3 read one section at a time. Having over 250 pages it teaches proper business analysis on many varied topics surrounding operators. 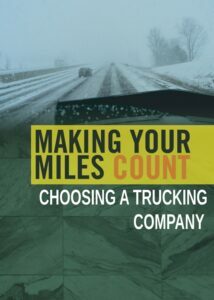 Making Your Miles Count: Choosing a Trucking Company outlines the successful business model needed for every Canadian operator to thrive in the trucking industry. It’s benefit is consistent with the first book in the series. If “…taxes, taxes, taxes” saves ten thousand dollars (+) a year in taxes, “…Choosing a Trucking Company” can aid that much (or more) in lost revenue or even a decade or more of wasted time and energy. Every operator or potential operator should get to know their industry by reading it.